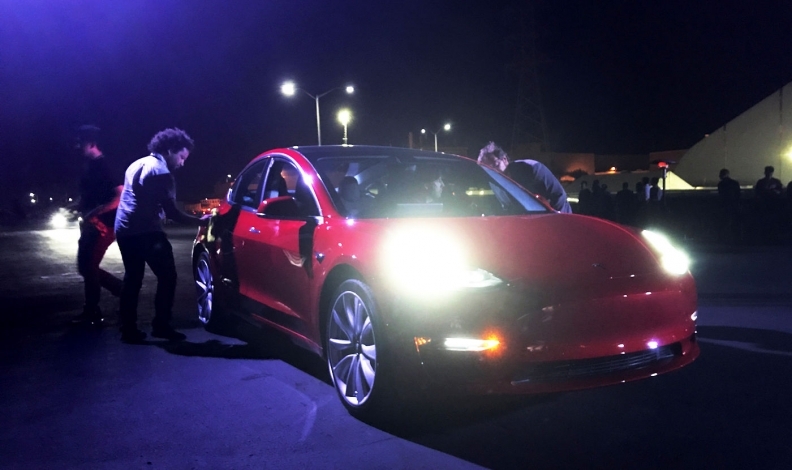 FREMONT, Calif. -- Tesla has finally delivered its long-promised, affordable Model 3 small electric car to its first 30 customers — all employees — at a company party Friday night but its Canadian timeline remains unknown. Tesla representatives didn’t respond to calls or emails from Automotive News Canada requesting information about when the Model 3 will arrive north of the border, and the Associated Press reports it could take years to get the vehicle to all the people who want to buy it. The automaker has been hard at work installing a fast-charging network, coast to coast in Canada. “Should finish trans-Canada this year,” CEO Elon Musk said of the network in a tweet published in May. Musk said around 500,000 people worldwide have already put down a US $1,000 deposit to reserve a Model 3. People ordering a car now likely won't get it until late 2018. Cars will go first to employees and customers on the West Coast; overseas deliveries start late next year, and right-hand drive versions come in 2019. With its US $35,000 starting price — half the cost of Tesla's previous models — and range of up to 498 km, the Model 3 could bring hundreds of thousands of customers into the automaker's fold, taking it from a niche luxury brand to the mainstream. Musk said Tesla will build the cars as fast as it can, but acknowledged that supply issues and other complexities will make it tough to reach his goal of making 500,000 cars next year. Fourteen-year-old Tesla has never made more than 100,000 cars in a year. The Model 3 has long been part of Palo Alto, California-based Tesla's plans. In 2006, Musk said Tesla would eventually build "affordably priced family cars" after establishing itself with high-end vehicles like the Model S, which starts at US $69,500. This is the first time many Tesla workers will be able to afford a Tesla. For the base price, customers will get a Model 3 with 322 km of range. But the price can rapidly increase from there. Black is the only standard colour, for example; any other colour is US $1,000 extra. A fully loaded Model 3 with 498 km of range and Tesla's full semi-autonomous Autopilot system costs a hefty US $59,500. That could be a stretch for some buyers, especially since there are limits on the US $7,500 U.S. tax credit for electric cars. Once an automaker sells 200,000 electric cars in the U.S., the credit phases out. Tesla has already sold more than 126,000 vehicles since 2008, according to estimates by WardsAuto, so not everyone who buys a Model 3 will be eligible. In Canada, Quebec, Ontario and B.C. all offer government incentives — some as high as $10,000 —on the purchase of electric vehicles. Quebec has also passed a law requiring automakers to sell a minimum number of electric, plug-in hybrid and hydrogen fuel-cell vehicles each year. Starting with the 2018 model year, 3.5 per cent of all auto sales in the province will have to be from those types of vehicles. Potential customers worldwide also could lose faith if Tesla doesn't meet its aggressive production schedule, or if the cars have quality problems that strain Tesla's small service network. The compact Model 3 may not entice a global market that's increasingly shifting to SUVs, including all-electric SUVs from Audi and others going on sale soon. But Musk says Tesla worked hard to make the Model 3 simpler and cheaper to make than Tesla's previous vehicles. It has one dashboard screen, not two. It doesn't have the fancy door handles that caused problems on the Model S, or the gull-wing doors of the Model X SUV. It's made primarily of steel, not aluminum. It has no instrument panel; the speed limit and other information normally there can be found on the centre screen. It doesn't even have a key fob; drivers can open and lock the car with a smartphone or a key card.